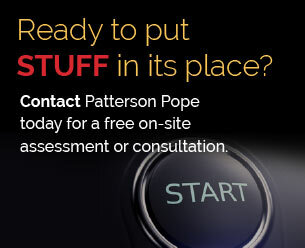 Patterson Pope knows storage. It’s a refrain we repeat again and again, and it accurately reflects not only the way we run our business but our passion for the subject. While that may be hard for some people to believe, it’s nonetheless true. Hey, there are also people who enjoy strapping on a wind suit and jumping off cliffs. Some people like watching soccer. To each their own, right? Yep. Storage floats our boat. One of things that is most exciting for us is the opportunity to work closely with a variety of architects and designers. These are some kindred spirits, inspired by innovative spaces, endless possibilities and even some avante-guard ideas. The professionals we work with help build banks, schools, office buildings, military installations, and more. Really, their creations are the lifeblood of our communities. It’s a pleasure and a true privilege to call them our partners on projects. A few weekends ago, some friends and I played a round of golf. We are not exceptional players by any stretch of the imagination. We enjoy getting out there occasionally – usually once a month or so. Given our busy schedules, that’s about all we can accommodate. Despite this infrequency, in our minds we expect to break 90 every round. Never mind the fact that this rarely occurs. Our expectations are pretty much set. Sometimes it’s interesting how upset four middle-aged guys can get about not being an expert in something they do so rarely. Golf may be an innate skill for some, but for us? Not so much. That story, in addition to being sadly true, also serves as an analogy. As storage gurus, we understand that even architects and designers don’t spend an inordinate amount of time studying the intricate details of our favorite subject. The bottom line is that they don’t have to; that’s the magic of working as a team. A&D professionals have a lot on their plates. They are very good at their jobs, which includes knowing when to partner with other professionals – and which ones – in areas where they are not as familiar. Sometimes, we’ve seen A&D pros give a storage solution design a go on their own. On occasion, it turns out great! Usually, though… well, I’m reminded of my attempts to drop a chip onto the green from 40 yards. All the right intentions, but a little light on the follow-through. As storage pros, we have the planners and designers on our own staff who have close working relationships with the best equipment suppliers in the industry. Our team’s education, experience and expertise combine to deliver not only exceptional results, but help to navigate difficulties – sometimes before they even arise. It is with that in mind that we have compiled a brief list of some of the reasons it behooves architects and designers to leave storage design specifically to the storage experts. Call us the Bubba Watsons of shelving. #1 We do storage every day. Every. Day. We have relationships with more than a dozen vendors, whose manufactured items are some of the most well-known and respected in the industry. All day, every day, we’re about storage. Shelving. Files. Art niches. High-density. Manual. We love this stuff! #2 We like doing it. Stop rolling your eyes, will you? We’re serious! #3 We have probably seen your particular storage challenge before. If not the exact incarnation, then something very similar. When you’ve done as much good work as we have for as many different kinds of businesses, chances are good that we’ve experienced your challenge before, or something very similar. Our team doesn’t have the need to re-invent the wheel to solve a challenge. That saves you time, money and potential headaches. #4 It is more challenging than you think it is. For an architect to be successful, they must not only know their stuff, but know with whom to partner for important elements of a job. Storage can be the devil in the details for an architect. If you don’t spend time with it every day like we do, it’s hard to really understand the level of detail, preparation and the myriad special considerations there are at every step in the process. Architects and designers don’t really want to have to look up the differences in the various Spacesaver Mechanical Assist Mobile Shelving floor rails or master weight load formulas for what their customers need to store! #5 When you have a fire and call 911 – you don’t want an astronaut showing up – you want a firefighter. There’s a saying that goes, “There are only two ways to do something: ‘right’ or ‘again.’” When A&D pros find themselves in a pinch, they want to be able to reach out to someone whom they know will be able to fix the problem. At Patterson Pope, there’s no quibbling when it comes to getting something accomplished that exceeds expectations. We’re kind of stubborn that way. We may not be able to rescue an architect’s kitten from a tree, but we’re pretty awesome about storage solutions. We like puzzles. We enjoy solving problems. We have strong relationships with industry vendors who are just as passionate about this subject as we are. Look, the fact of the matter is that we value creativity and love working in this arena. Designing a space that optimizes high-density storage systems or state-of-the art shelving is our niche. Over the years, we’ve helped design spaces for university libraries, professional sports teams, banks, military facilities, hospitals and clinics, and other commercial and industrial clients. Every single one of them – past, present and future – is an opportunity to perform, to build, and to create. What’s the bottom line? Whether you are an architect, a designer, or a facilities manager charged with updating or recreating a storage system in your organization, Patterson Pope is more than a name to know; it’s a name to rely on. Leverage our expertise in the execution of your project, and you’re sure to exceed expectations.